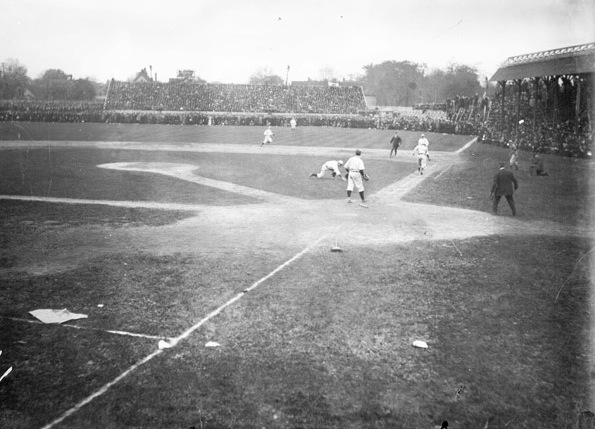 Bennett Park played host to a crazy game in 1908. (via The Library of Congress-American Memory). In 2007, Cait Murphy published Crazy ’08, a highly readable, impeccably researched book on the 1908 baseball season. Admittedly, it was an unusually newsworthy year in baseball, which may explain how she overlooked a truly crazy game played on August 8, 1908. On that Saturday afternoon in Detroit, Burt Keeley was the Senators’ starting pitcher at Bennett Park (the forerunner of Tiger Stadium). What made his outing so unusual was that he was still on the mound at the end of the game. Of course, complete games were the norm in 1908 (Keeley finished 11 of his 15 starts in 1908, his only full season in the majors), so that in itself is not unusual. But since the final score was Tigers 18, Senators 1, his presence on the mound at the end of the game likely raised some eyebrows. The Tigers led the American League in scoring with 644 runs in 1908, so their offensive outburst was not a total surprise. But why did it occur on this particular day? There doesn’t appear to be any logical reason for it, so let’s explore other possibilities. I doubt any member of the 1908 Detroit Tigers squad was familiar with Chinese numerology, but the game they played on August 8, 1908 (in other words, 08/08/08), was curiously apt. In Chinese numerology the number 8 is associated with fortune and prosperity. 888 means the same thing threefold. Of course, this doesn’t explain why the Tigers were singled out for a windfall. I wish I could say that 1908 was the Year of the Tiger, but it wasn’t (it was the Year of the Monkey, if you’re wondering). Certainly not in the 1908 World Series, which the Tigers lost to the Cubs, four games to one. That was Keeley’s first big league season, but his size and age set him apart from other rookies. Even by the standards of the day, he was hardly an imposing figure on the mound (5-foot-6 and 140 pounds at the low end; 5-foot-9, 170 at the high end). Since he was 28 years old, you might suspect he had toiled in assorted minor leagues levels for up to a decade. Well, he had an outstanding career at Notre Dame and did pitch a few games in 1901 for the Bloomington (Illinois) Blues of the Three-I-League. But what was he doing from 1902-1907? As you might suspect, he had not given up the game. Not only was he still playing semipro ball, it was at such a high level it overlapped with minor league ball. Keeley was playing for the Gunthers of the Chicago City League, a 10-team semipro organization. One of the franchises, the Logan Squares (named after a northwest Chicago neighborhood) attained some fame by defeating both the Cubs and the White Sox in exhibition games after both teams had appeared in the 1906 World Series. Keeley’s success in the league had not gone unnoticed by the Cubs or the Sox, but their efforts to sign him were unsuccessful. Keeley’s contract with the Chicago City League created some grey legal areas, but somehow the Washington Senators managed to sign him. Keeley’s rookie season with the Senators was so-so. He served as both a starter (15 games) and a reliever (13 games). Despite the August 8 game, by the end of the season, Keeley had a 2.98 ERA in 169 innings. His record was 6-11, but considering the Senators’ record of 67-85 (seventh place), a losing record was nothing to be ashamed of. In fact, Washington had never had a winning season even though it was one of the inaugural AL franchises. The team had finished last three times and never higher than sixth. The Senators would remain doormats until Clark Griffith took over as manager in 1912 and guided the team to a 91-61 record, good for second place. Unfortunately, it was a distant second (14 games behind) as the Red Sox coasted to the pennant on the basis of a 105-47 record. Incidentally, it was the first year the nickname Red Sox was pinned to the franchise. Keeley was just a year younger than teammate Tom Hughes, an eight-year veteran who led the team in victories with 18. As for the other starters, Charlie Smith won nine games, Bill Burns won six, and Eli Cates won four. Burns was particularly effective, with a 1.70 ERA over 164 innings. Also in the mix was a promising 20-year-old in his sophomore season who had to settle for a 14-14 record, even though he had a 1.65 ERA. He certainly finished the year with a flourish. Over Labor Day weekend, he shut out the Highlanders three times in four days (September 4-7) in New York. 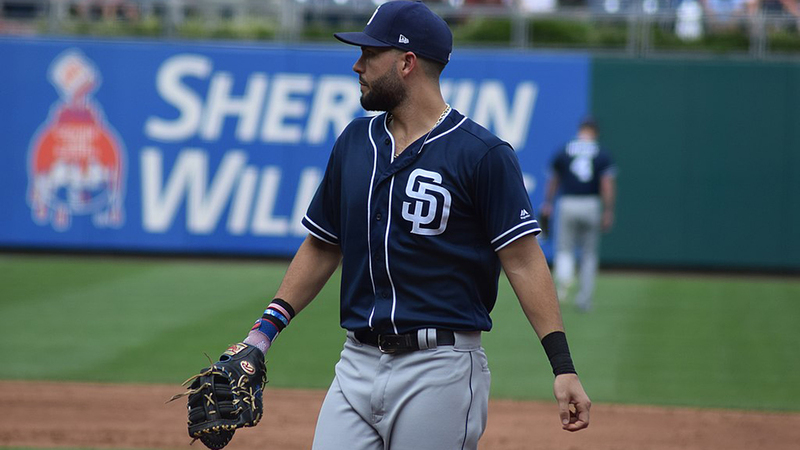 On September 14, he started and completed both games of a doubleheader against the A’s, winning the first game 2-1 (in 10 innings) and losing the second 5-0 (complete after eight innings due to darkness). The young pitcher’s name was Walter Johnson. Pitching was primo on the 1908 Senators but that was true of the AL as a whole. The Senators’ staff ERA was 2.34, and that was just a tad better than the league average of 2.39. The league range was narrow, from 2.02 (Cleveland) to 3.12 (New York). By contrast the AL range in 2018 was much wider, from Houston’s 3.11 to Baltimore’s 5.19). Even by 1908 standards, the Senators were a punchless bunch. Part-time infielders Jim Delahanty and Bob Unglaub hit above .300 (Delahanty at .317/.376/.394; Unglaub at .308/.327/.389), but no one else hit above .254. First baseman Jerry Freeman led the team in RBIs with 45. The team “slugging” percentage was .293. The Senators scored just 479 times during the season. That averages to just a tad better than three runs per game. They were shut out 19 times. The team batting average was just .235, but that wasn’t quite as bad as it sounds, since the league average was a mere .239. Only one team-the pennant-winning Detroit at .263-hit better than .245. Pitching for the Senators was a thankless task in those days. Ironically, Walter Johnson would go on to pitch 110 shutouts. When the subject of records that will never be broken comes up, put that one at the top of the list. So when the Senators fell behind early on August 8, their chances of staging a comeback were virtually nil. One wonders why manager Joe Cantillon would allow Burt Keeley to absorb such a shellacking. Sure, 110 years ago starters expected to go deep into the game, but if ever there was an exception to the rule, this was surely it. On the other hand, the Senators started the day with a record of 37-59. The (relatively) hard-hitting Tigers were at the top of the heap with a 60-37 record. The August 8 contest was the first of four in Detroit and it was best to keep the remaining pitchers fresh for use in potentially winnable games rather than bring them in just to eat innings in a lost cause. If tasking Keeley to take one for the team was Cantillon’s strategy, it proved to be sound, as the Senators ended up splitting the series while scoring just nine runs over the set, winning games three and four by 3-2 scores. Also, bullpens were shallow in 1908. Over the course of the entire season, only 11 hurlers toiled out of the pen for the Senators, and only eight appeared in 10 or more games. Today 12 or 13 pitchers are standard on major league rosters from April through August. In 2018, 30 different pitchers appeared for the Baltimore Orioles, though admittedly, Danny Valencia and Jace Peterson are usually position players. So on August 8, 1908, manager Cantillon may have figured that sending in a fresh pitcher for mop-up work was a waste. Better to let Keeley absorb the beating (his consolation prize was a complete game), get an unwinnable game over with, get a good night’s sleep, and have at it again the next day. During Keeley’s eight innings of humiliation, he faced 49 batters. It’s hard to believe, but though Keeley gave up 22 hits and walked three, his pitch count was probably not outrageously high. The time of game was 1:40, not terribly unusual in those days, but not enough time to absorb an elevated pitch count. One suspects that given the score, Keeley was just throwing strikes and the hitters went up there swinging. The Tigers certainly shared the offensive wealth, as all the starters (including pitcher Ed Willett) got at least two hits. One also suspects that umpire Tommy Connolly’s strike zone got bigger as the game progressed. In those days a solo ump was the norm, so Connolly might have been worn out by having to monitor all the action on the base paths when Detroit was batting. The game was over almost before it started. The Tigers got a quick three runs in the first inning; the Senators responded with one in the second. After that it was no contest. The Tigers scored five runs in the bottom of the third, one more in the bottom of the fourth, six in the bottom of the fifth, and finished off the contest with three in the bottom of the sixth. After six innings, the score was 18-1. The offense took the rest of the day off. Remarkably, this Tiger mauling took place without 21-year-old wunderkind Ty Cobb, who left on August 3 to get married in his home state of Georgia and returned too late to participate in the August 8 contest. You might think it unusual that Detroit management would allow Cobb to do this. Well, the bosses didn’t. Cobb didn’t ask permission. He simply left. Even then, a superstar could get away with such antics. He did not attempt to tack on a honeymoon, however. That might have been a bridge too far. One might wonder why Cobb was in such a hurry. Why not schedule the wedding for two months later after the season was over? Well, he was marrying an heiress, so perhaps he didn’t want her to have any second thoughts. In all things financial, Cobb was a pretty shrewd operator. He could say with justification that his presence was not missed on August 8. Today it would be hard to imagine a team scoring 18 runs without the benefit of a home run, but that was the case. In fact, there was but one triple (by Sam Crawford, the all-time triples leader) and five doubles. The other 16 hits were singles. At the end of five innings, with the Tigers leading 15-1, manager Hughie Jennings saw no reason to keep starter Ed Willett in the game. George Winter took over and pitched four shutout innings. Willett finished the day with his record at 12-3. After that he slumped, going 3-5 the rest of the year, which may be one reason why he did not appear in the World Series. He did appear in the 1909 Series, however, after enjoying his best season, going 21-10 with a 2.34 ERA. It’s sad to say, but the 18-1 loss was likely Keeley’s most memorable game. He didn’t let it get him down, however. Less than two weeks after the Detroit debacle, he pitched his lone shutout, a 2-0 gem against the Browns— no doormats in 1908, as they finished at 83-69. Keeley’s major league career started late and finished early. He pitched in just two games for the Senators in 1909 and logged most of his innings with the Omaha Rourkes (named after the team owner and manager) of the Class A Western League. Commendably, he turned in a 20-13 record. He also spent the entire 1910 season with Omaha, emerging with a 16-19 record. Keeley’s playing career ended in 1911 after his shoulder was injured in a train wreck. He served as manager of the Chicago franchise in the Federal League in 1913, the year before the league assumed major league status. In his honor, the team was nicknamed the Keeleys. Keeley was something of a celebrity in Chicago, but his career is largely fodder for the memory hole. But on the eighth day of the eighth month of the eighth year of the 20th century, he occupied a dubious but unique niche in baseball history. Interesting! I wonder when did solo umpiring stop? I imagine it went from 1 to 2 (2nd base), and then to 4. Or did it go from 1 to 4 all of a sudden? Early match games actually had 3 umpires, one provided by each team and a third “neutral” umpire. In 1898, 2 umpires were standardized. In 1933, 3 umps became the norm (home plate, first and the third covering 2/3. The 4-man crew did not make the rule book until 1952, after Jackie Robinson debuted, and after Joe DiMaggio had retired.